7-Day AM/PM XL Detach N' Go Pill Organizer by Carex is designed to offer you complete flexibility for your daily pill routine. 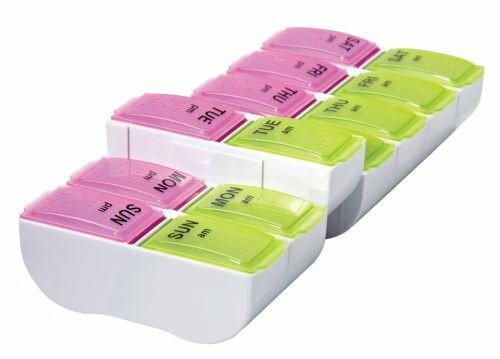 Now with this clearly-organized, portable pill organizer, you never have to miss a day of medication. The easy-to-use snap-on lids form a tight seal to keep medication secure and each compartment interlocks to form a full week or detaches for individual days. 7-Day AM/PM XL Detach N' Go Pill Organizer features seven interlocking detachable compartments that are split between self-contained AM and PM compartments. 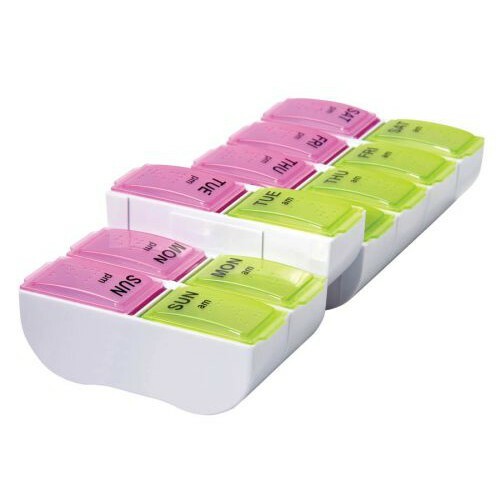 Each compartment holds up to 50 aspirin-sized pills, so you don't have to worry about frequent refilling. The 7-Day AM/PM XL Detach N' Go Pill Organizer is the perfect choice for anyone on a twice-a-day medication or vitamin schedule. Vitality Medical also carries other medication supplies, such as the Reminder Rosie. Extra Large Weekly Medication Organizer. Each Section Is a Self-Contained AM/PM Pill Box. Each Compartment Holds 50 Aspirin-Sized Pills.